I am removing a sliding glass door and turning the resulting hole into just a wall. Building materials for the wall are inclusive of drywall, insulation, tyvex, 2″x6″x8′ planks, etc. so no brick or anything to be installed for the wall as I have vinyl siding. What is the installation cost? I have already purchased all the required building materials as required per the contractor doing the job, I just want to know what a fair installation cost is. 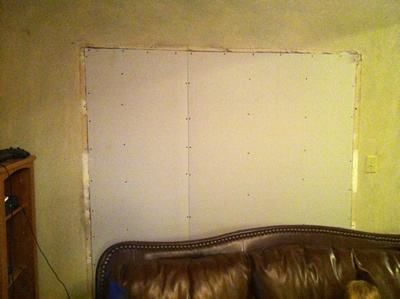 The picture is of the already removed glass door and subsequent installation of wall, not completely finished obviously. Sorry, it’s hard to give a fair installation cost with the details you’ve provided. How much is the contractor charging for the work? This is a job that (if all materials are there, screw and all) I could do it for$725. We have two bedrooms that need closets installed and two more bedrooms that need the framework and closets installed how much would that be? Hi, If I’m understanding your question right you would like to know the overall price for labor of a job of this type. A contractor’s fair price in my opinion to a customer would be $850.00 for labor But then again that is my opinion only. I put mind to understand seam screws have been well secured? Seem very to close to edge of drywall, does hold well? Here I charge high price of $120US for 8′ x 10′ foot section labor only. Thank you for very much interest.